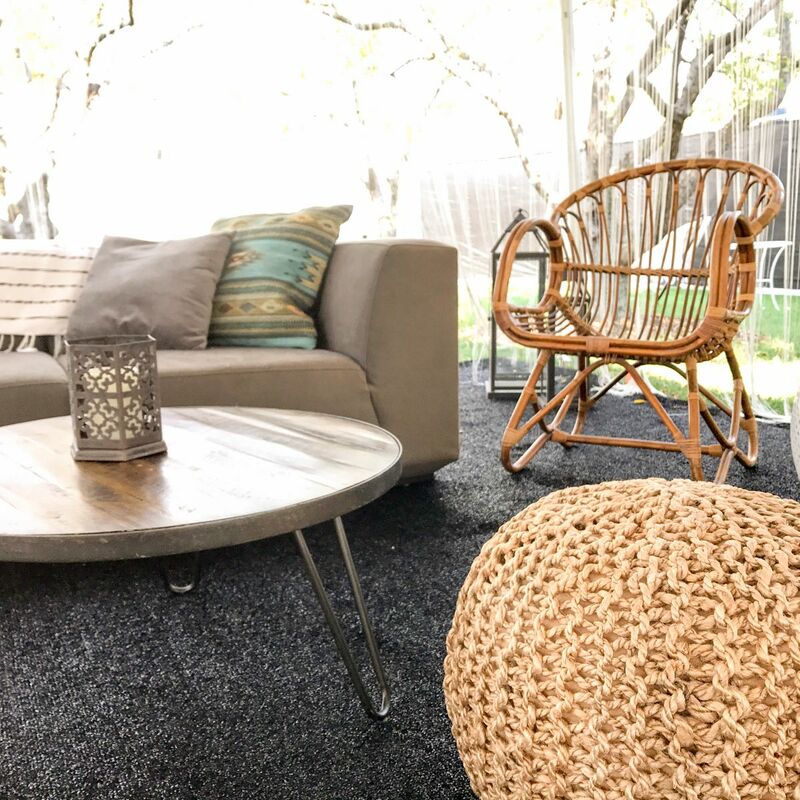 Five trucks, 10 crew members and over 400 hours total worked in three days to create 11 eclectic and well-designed spaces at one of the best music festivals in the country. 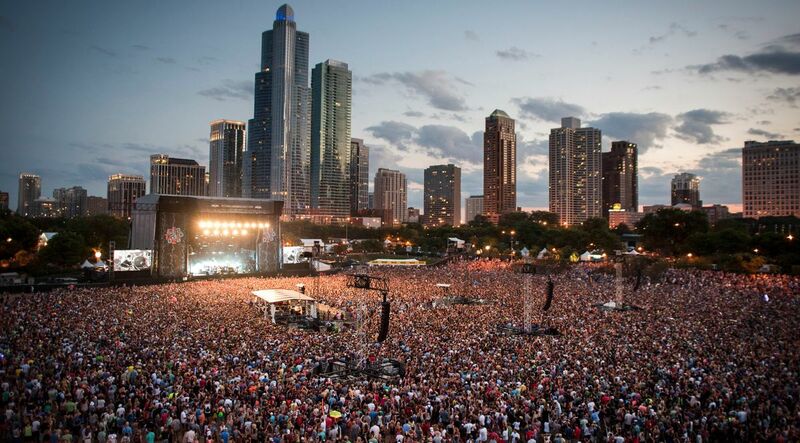 The Panacea team spent a week in the Windy City to help C3 with Lollapalooza, and we had the best time! Read below for all the deets! 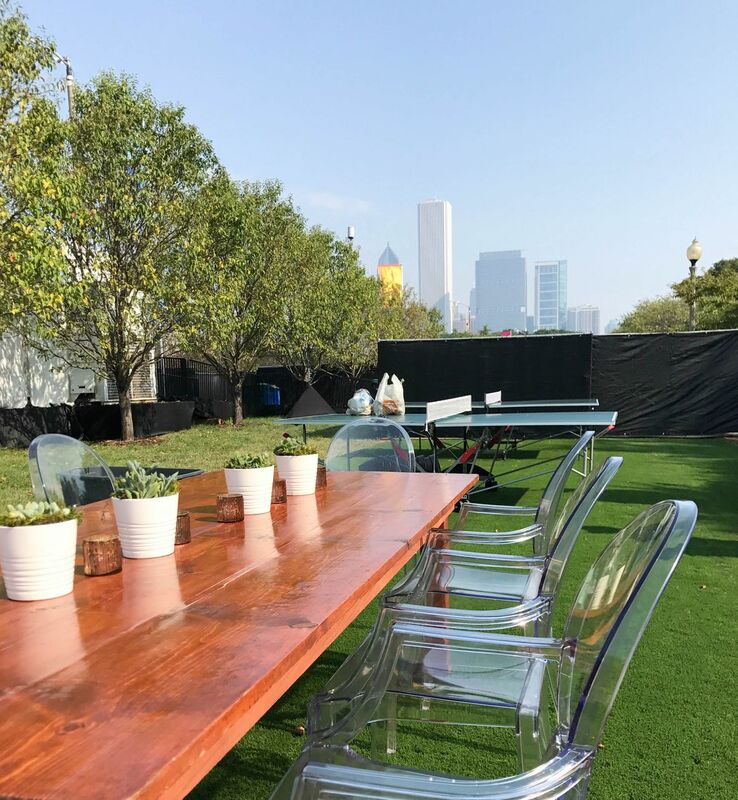 The eleven spaces consisted of two headliner compounds on each end of the park behind the main stages, three VIP cabanas, the Red Bull webcast tent, the Spotify interview tent, the Nylon interview tent, the BMI side stage hospitality lounge, and the festival Media Lounge. Each space was designed with the client's style and brand in mind. One of the biggest challenges that festivals pose is choosing pieces that will be conversation starters, but will also withstand the outdoor elements. With an evacuation due to a large storm on Thursday night, we were lucky that all of our inventory held up under tents and inside trailers. Check out the photos below to see some of the spaces and let us know in the comments below what you think! 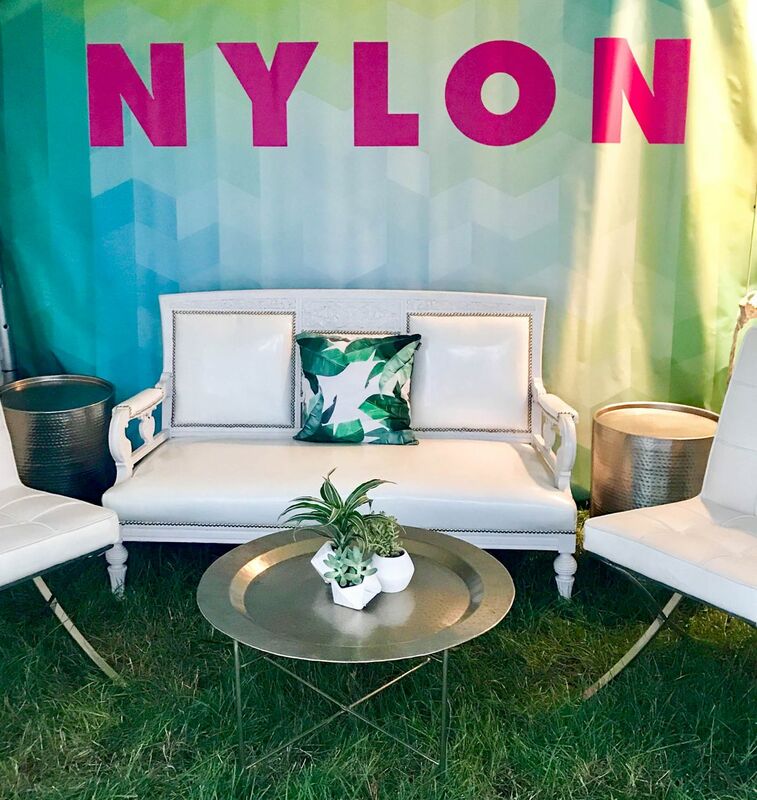 Nylon contacted our team directly to style their interview tent. We went with a clean look featuring our Ulrich chairs and white Monroe settee, along with two hammered drum side tables and a Casablanca cocktail table. The white provided a nice contrast against the colorful geometric backdrop we created. 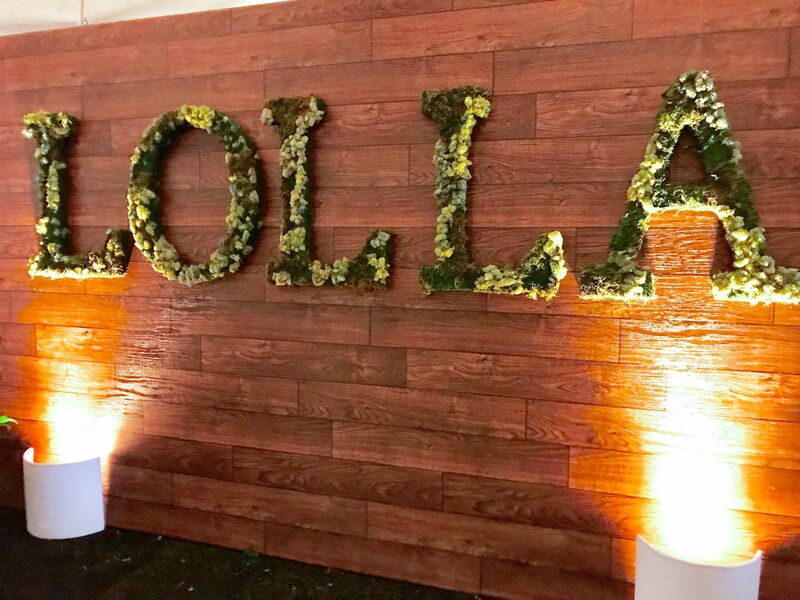 Add the Palm Leaf pillows and adorable geometric succulents and voilà, a perfect space for Nylon to hang out and conduct interviews during Lollapalooza 2017. 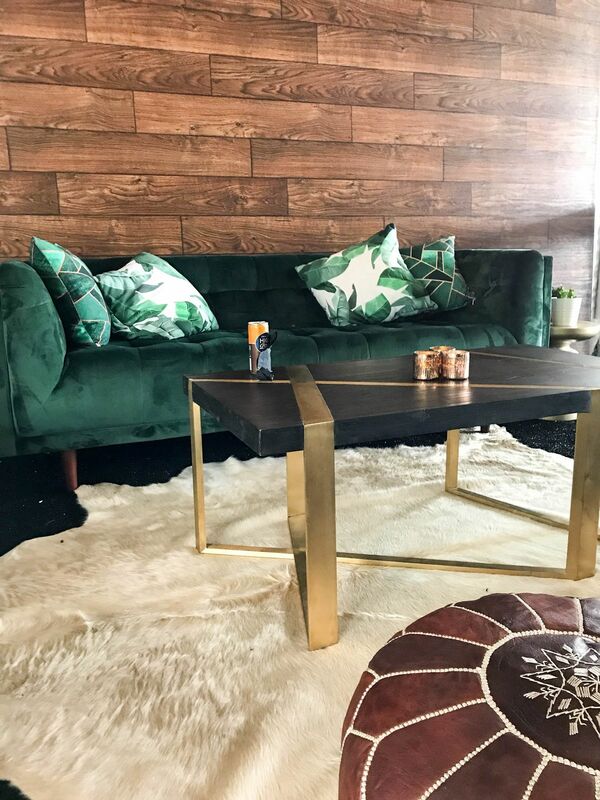 The Spotify interview tent featured a fun rug, our Alberta X coffee table, the Drake sofa, new gray barrel chairs (coming to the website soon!) and some great throw pillows. 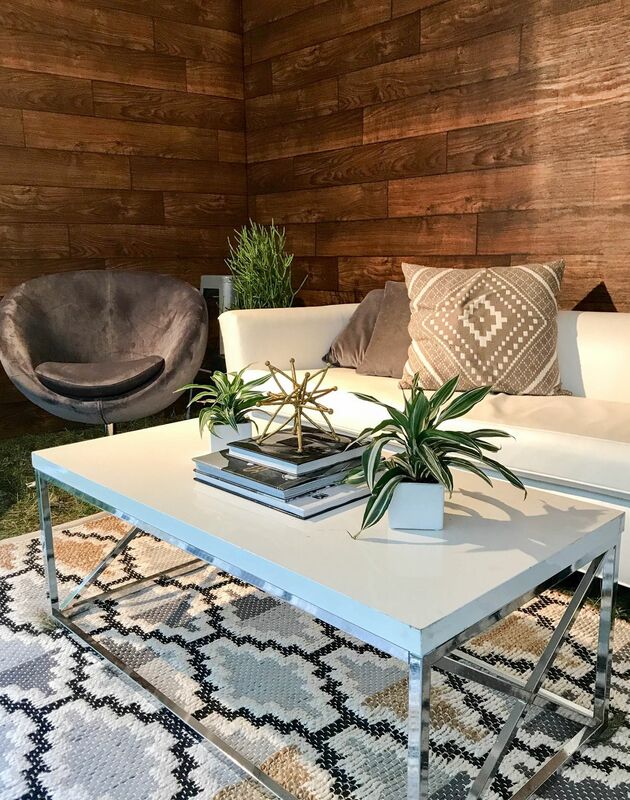 We worked with local company Frost Lighting to create the wood wall treatment, and added plants and accessories to create a more welcoming vibe. The Red Bull webcast space was so fun to design. 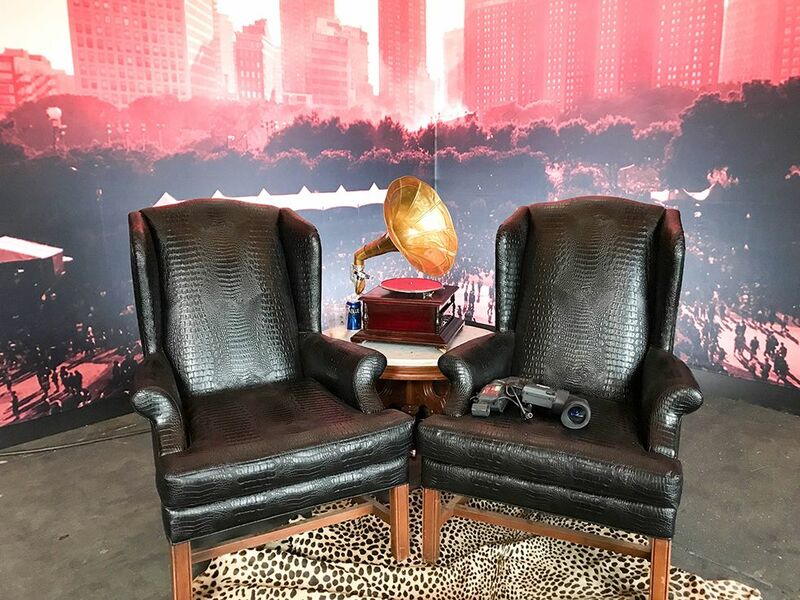 Inspired by infamous speakeasies of Chicago, we designed the space with a few of our more detailed and unique vintage pieces including our antique gramophone, Operator side table, our favorite crocodile wingback armchairs, and this burgundy red sofa (both coming soon to the site!) and more. 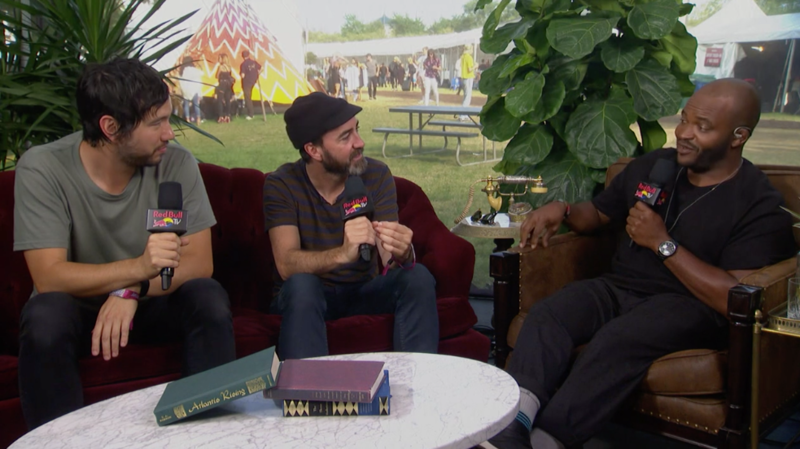 We were so excited to see acts like the Shins, Etty and Perry Farrell, Milky Chance, Sylvan Esso and more lounging on our collection for interviews throughout the fest. Check out some of Red Bull TV's interviews here! The highlight of the week in our book? Lorde gracing our new blush settee with her presence in her headliner lounge. It was even better when she posted it to her own Instagram to the tune of 300,000+ likes, and then Teen Vogue reposted it later that day! Can we get an AMEN for the Panacea team!? 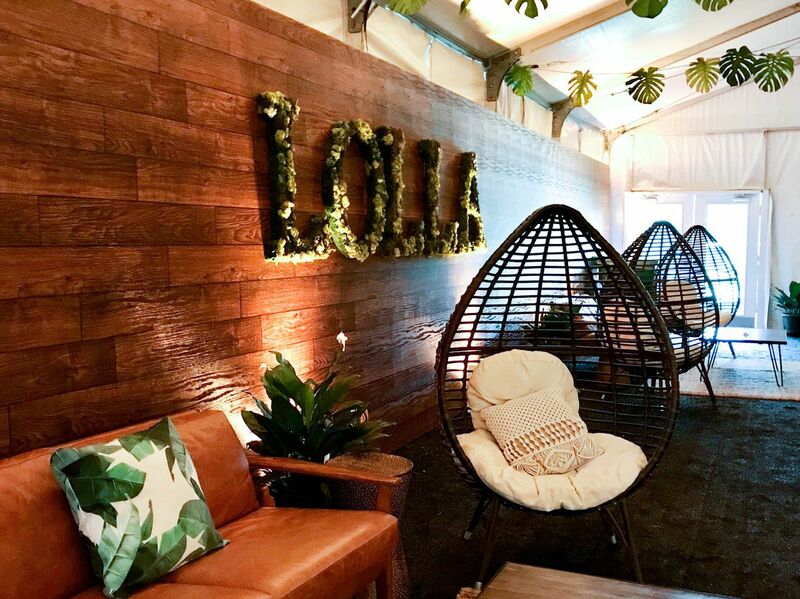 We had a great time designing headliner compounds like this one featuring some of our favorite poufs, Lucia rattan chairs, Marfa cocktail tables, a throw from Due East Co, and some pillows from the *new* Lily Koi collection! 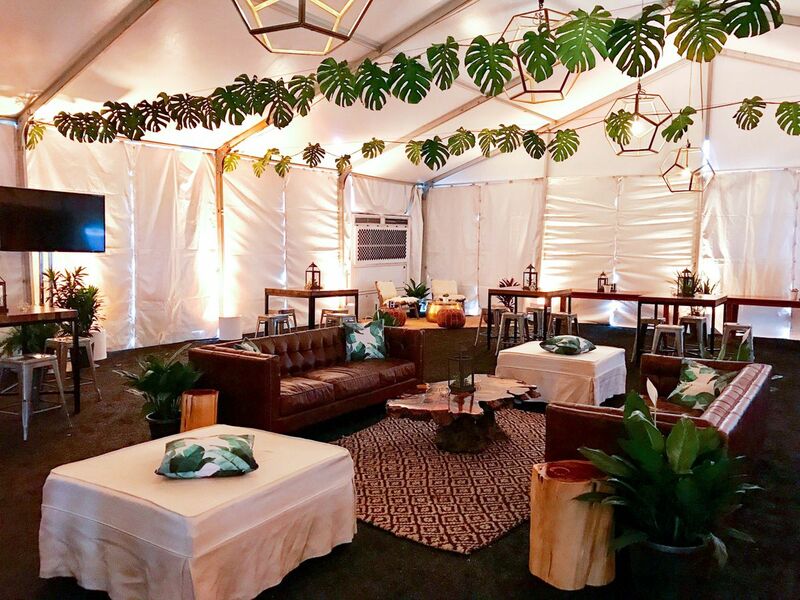 The VIP areas were spacious and excellent for displaying some of the best pieces in our inventory. Especially with the cityscape of downtown Chicago for the dining area as shown above. Our Jarvis settee from West Elm along with our birdcage chairs made for a warm and inviting space along a natural and rustic backdrop. 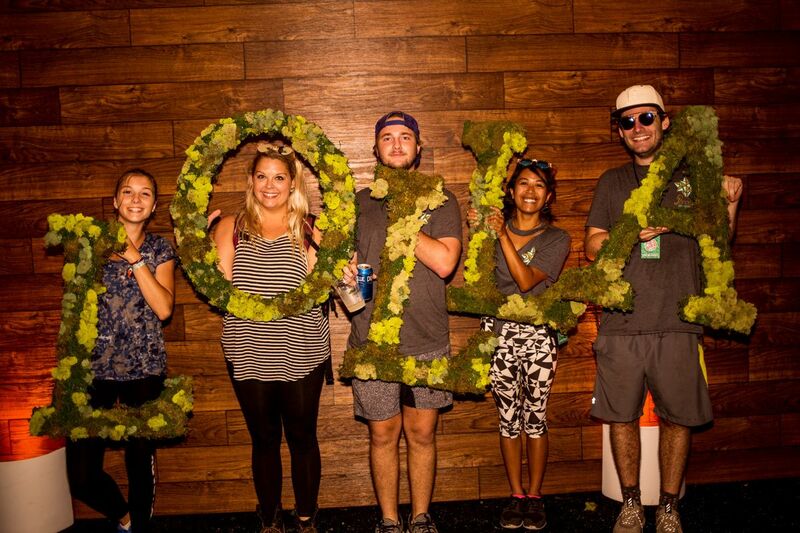 We had the best time working alongside the C3 team, staying at the Chicago Athletic Association hotel and joining in on the festival fun throughout the week. All in all - a complete success and we're already brainstorming for next year! 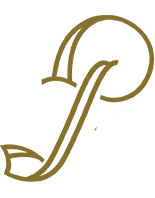 As we embark on festival season, stay tuned for more great Panacea work at ACL, the Austin Trail of Lights and more!